It wasn’t the first time a young evangelical woman had lamented to me the aimless, rebellious character of her younger brother. Growing up together their home had tended toward the fundamentalist end of the Protestant spectrum. Church was mandatory; doubt was discouraged. In college and afterward she found her way into an evangelical congregation that tended toward Reformed theology, but her younger brother never seemed to grow up. He deliberately antagonized his parents and sister. She described to me one scene that typified his protest. While gathered together in the living room, as the rest of the family watched television or read a magazine, her brother flaunted his copy of a Richard Dawkins screed against religion. Only he didn’t seem to be actually reading the book. Rather, he peered over the pages to see what kind of reaction he was inciting. Classic case of a “subtraction story,” I told her. A what? The term comes from the 2007 book A Secular Age by the Catholic philosopher Charles Taylor. Her brother probably couldn’t explain any sophisticated scientific or philosophical objections to Christianity. But he found in Dawkins a “hero narrative” to explain his “coming of age,” his maturation away from the childish religion of his youth and family (365). “The core of the subtraction story consists in this,” Taylor writes in A Secular Age, “that we only needed to get these perverse and illusory condemnations off our back, and the value of ordinary human desire shines out, in its true nature, as it has always been” (253). Fundamentalism couldn’t protect this young man from the forces of modernity that make faith increasingly implausible. Indeed, an intellectually restrictive fundamentalism might have even made his reaction more likely, because as Taylor observes, the “more childish one’s faith, the easier the flip-over” (307). Evangelical apologists have traditionally responded with biblical proofs and technical counterpoints to scientific materialism as popularized in the last decade-plus by the so-called New Atheists, including Dawkins. But what if science, reason, and logic aren’t the problem or solution to firm faith? What if the challenge runs far deeper? What if the problem of our secular age is more fundamental? Probably no book published in the last 10 years has been so formative for my thinking and ministry as Taylor’s A Secular Age. Taylor (b. 1931) challenges my own faith as much as he equips me to counsel other believers swimming upstream in cultures not conducive to belief. I regret that the length of his work (nearly 900 pages) and the density of his prose preclude most pastors and other Christian leaders from even picking up the book. Yet I remain convinced that taking up the challenge of Taylor would equip Christians with invaluable historical, theological, sociological, and philosophical context as they carry out the Great Commission (Matt. 28:18–20) in our secular age. Pastors, missionaries, and social workers in particular would benefit. “In fact, these are the core audience for this book precisely because I believe Taylor’s analysis can help pastors and church planters understand better the contexts in which they proclaim the gospel,” writes James K. A. Smith, who teaches philosophy at Calvin College. Probably no author has done more than Smith to popularize Taylor for the benefit of the church. “In many ways, Taylor’s Secular Age amounts to a cultural anthropology for urban mission” (xi). The purpose of Our Secular Age, then, is to read and apply Taylor to various aspects of the church’s life and mission. Interpreters and practitioners will assess Taylor from multiple perspectives, including his reading of the Reformation and medieval philosophy, and apply A Secular Age to everything from healthcare to liturgy to pop culture and politics. In this introduction I aim to familiarize readers, many of whom will never pick up A Secular Age, with Taylor’s basic arguments and also with a key interpreter from the last decade. And I seek to demonstrate one particular way Taylor has deepened my understanding as a writer, parent, and church leader. Nothing is easy about faith in a secular age. “Faith is fraught, confession is haunted by an inescapable sense of its contestability,” Smith writes. “We don’t believe instead of doubting; we believe while doubting. We’re all Thomas now” (4). Religion in a secular age is a private affair. That’s why the courts, media, and other cultural gatekeepers respond with incredulity when believers claim constitutional protection for their right to practice religion in the public square. Especially before the 16th-century Reformation but for a long time afterward, religion had been commonly known as a collective practice with communal accountability for the sake of the whole. Conformity was necessary. “In a world of indigence and insecurity, of perpetually threatening death, the rules of family and community seemed the only guarantee of survival,” Taylor writes. “Modern modes of individualism seemed a luxury, a dangerous indulgence” (168). Today, though, religion is the luxury, the dangerous indulgence. Faith is now more difficult than unbelief. We’re adrift in stormy seas of doubt—every man, woman, and child fighting for the lifeboat of belief. Something fundamental has shifted in Western culture that runs deeper than outward changes in technology. So what happened? That’s the question Taylor seeks to answer. “How did we move from a condition where, in Christendom, people lived naively within a theistic construal, to one in which we all shunt between two stances, in which everyone’s construal shows up as such; and in which moreover, unbelief has become for many the major default option?” (14). The world has changed. And religion changed with it. Less than one year after Taylor published A Secular Age, I published Young, Restless, Reformed: A Journalist’s Journey with the New Calvinists. In this book I sought to describe an unexpected shift in the beliefs and practices of young evangelicals. At the same time that moralistic therapeutic deism came to be known as the default religion of American teenagers, a significant minority of evangelicals had gone looking for an older, more countercultural theology. They found it in Calvinism. In travels around the United States I asked young and old, lay and clergy, “Why?” I’ll never forget one pastor who answered, “Because it’s true.” Granted, I said, but why would it suddenly be popular after a steady decline since at least the early 1800s? I published the book without a sufficient answer. But Taylor helped me find that answer—and a warning. Taylor provides historical and philosophical explanations for what Christian Smith and his colleagues with the National Study of Youth and Religion have revealed in their research. The decreasing numbers of Western youth who practice religion are indoctrinated into a version that emphasizes God as distant and uninvolved, though concerned with our good behavior. Mostly he just wants us to be happy. Religion aims to give us what we want, in material or therapeutic terms. Of course, that’s not how the Bible portrays God or how Christians have historically understood him. I mentioned that Taylor helped me answer, “Why Reformed theology today?” Here’s how: You really only have two options in a secular age. Either God is for you, on your own terms, or God sets the terms. And Reformed theology, with doctrines such as unconditional election, revels in the triune God as transcendent and inscrutable, yet immanent and sympathetic. God is no mere cosmic butler. To read about a God who doesn’t merely cater to our whims, you’ll need help from theologians of earlier generations. At least for a growing minority of young evangelicals, 18th-century Reformed theologian Jonathan Edwards is still their homeboy, more than 10 years later. “This is what makes Jonathan Edwards not only unthinkable but reprehensible to modern sensibilities: Edwards’s God is about God, not us” (Smith 115). Calvinism wouldn’t be gaining popularity in our secular age, though, if it were merely counterculture. You can’t just turn back the clock to 16th-century Geneva or 18th-century Massachusetts. The conditions of belief have changed. To see Taylor applied today, you need to visit Timothy Keller in his thoroughly secular Manhattan context. Compared to our ancestors, we have a bigger problem with evil and suffering. They lamented evil and suffering—and they experienced more of it than we do. Meanwhile, we demand answers from God and engage in theodicy. Why do we, unlike our ancestors, believe the existence of evil could disprove God? Given these conditions, Keller aims to give modern skeptics a reason for God. And Keller’s apologetic approach closely resembles Taylor’s. Smith describes Taylor’s apologetic in three steps. First, level the playing field with secularists by pointing out the problems faced on both sides. Second, show how “immanentist” accounts fall short of solving the problem in an emotionally and intellectually satisfying manner. Third, reveal how Christians might better explain human experience (120). Compare that approach to Keller’s three-step process: enter the culture, challenge the culture, and then appeal to the culture (120). Take heart, church. But beware. Taylor sees trouble in our camp. While many Reformed readers have read Taylor with profit, that doesn’t mean he necessarily sympathizes with their project. To summarize, Taylor faults the Protestant Reformation and modern evangelical Christianity for disenchanting the world and turning the focus on the self rather than on God through shared religious rituals” (774). He laments the shift from embodied to intellectual faith in what he calls Reform, described by Smith as “Taylor’s umbrella term for a variety of late medieval and early modern movements that were trying to deal with the tension between the requirements of eternal life and the demands of domestic life” (142). I wouldn’t expect a practicing Roman Catholic like Taylor to commend the Reformation. And there’s no doubt the Reformation unleashed a torrent of practices and beliefs that the magisterial Reformers did and would condemn. If nothing else, Taylor helpfully corrects believers in both Geneva and also Rome when he says, “Perhaps there is no ‘golden age’ of Christianity” (745). So even as I object to Taylor’s critique, I want to hear him out. And with Taylor’s help, we see a major problem ahead for the young, restless, Reformed. The “restless” component of the moniker has attracted the most attention in the last decade, and for good reason. It doesn’t seem to fit when juxtaposed with “Reformed.” But that’s the point. Writing in 2007 I didn’t know how things would shake out. Taylor captures why the “God as God” theology of Edwards and modern apologetics of Keller would appeal to many young evangelicals trying to buck a secular age. At the same time, Taylor showed me why Reformed theology would offer an enticing “coming of age” story for youth who grew up in pragmatic or liberal congregations. Something like the young man reading Dawkins, reading Edwards became for some of them a convenient, even safe way to create an individual identity apart from their parents and home church. But might their own children in our secular age rebel in yet another direction? We don’t yet know, then, whether the children of the “young, restless, Reformed” will imbibe more of the restless or the Reformed. Has the preaching of their churches and teaching of their parents weaned them off a need for individual authenticity? Or has Reformed theology become just one more tool for coping with our secular age? That’s no abstract question. It’s a test of genuine faith. If pure, undefiled religion is about God and not just our own flourishing, then it will lead us “to visit orphans and widows in their affliction, and to keep oneself unstained from the world” (Jas. 1:27). Where you see holiness, sacrifice, and love, you see religion that delights in God, religion that can survive a secular age. Edwards would say these are sure signs of religious affection. In our modern language, they’re signs that we’re following the risen Christ and not just treating our therapeutic needs. Yes, we risk succumbing to faddish theological trends. Yes, we struggle to escape the self. Yes, we need a more embodied religion to hold us accountable. But after 10 years of reading and applying Taylor, I’m confident. There is hope in our secular age. Editors’ note: Probably no book published in the last decade has been so ambitious as Charles Taylor’s A Secular Age. In it, Taylor seeks nothing less than to account for the spread of secularism and decline of faith in the last 500 years. And he explains why so many Christians struggle to believe, let alone share the gospel in a rapidly changing culture. 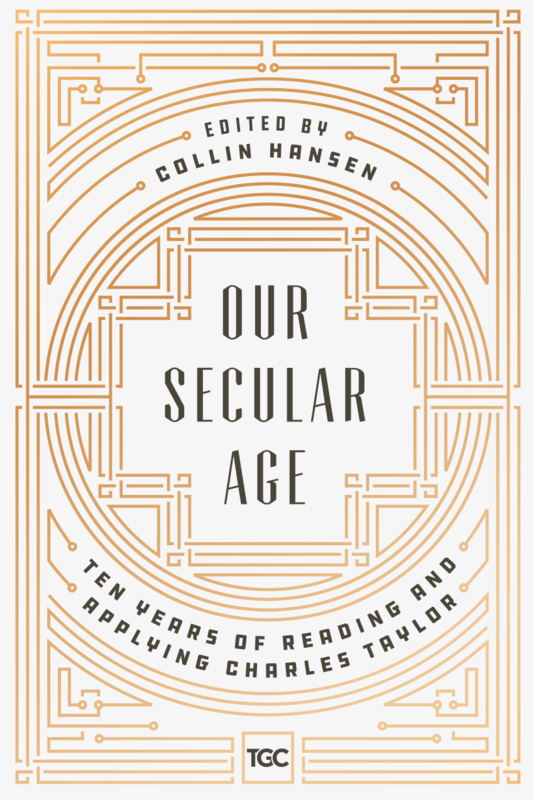 Now a remarkable roster of writers considers Taylor’s insights for the church’s life and mission in The Gospel Coalition’s Our Secular Age: Ten Years of Reading and Applying Charles Taylor. Nothing is easy about faith today. But through Christ, we know that endurance produces character, and character produces hope, even in our secular age. Our Secular Age is now available on Amazon (Kindle | Paperback) and WTS Books. ‘Our Secular Age’ Book Trailer from The Gospel Coalition on Vimeo.